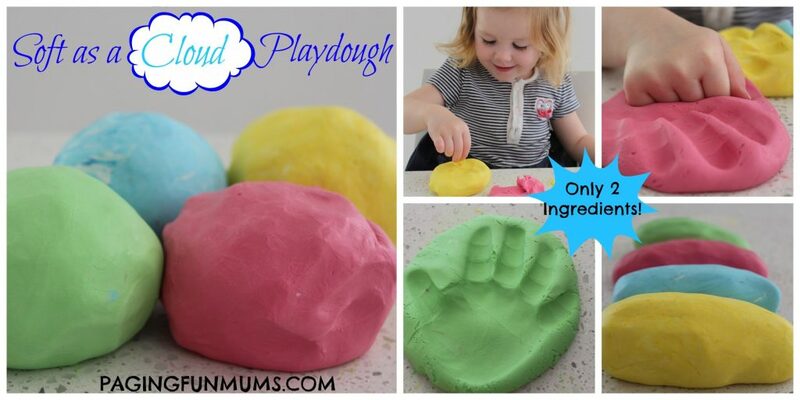 We love Playdough here at Paging Fun Mums so when I saw this recipe over at Kids Activity Blog which is not only a ‘no cook’ playdough recipe but is also made out of only 2 ingredients, we HAD to give it a try! Mix well using your hands. This part smells delicious! 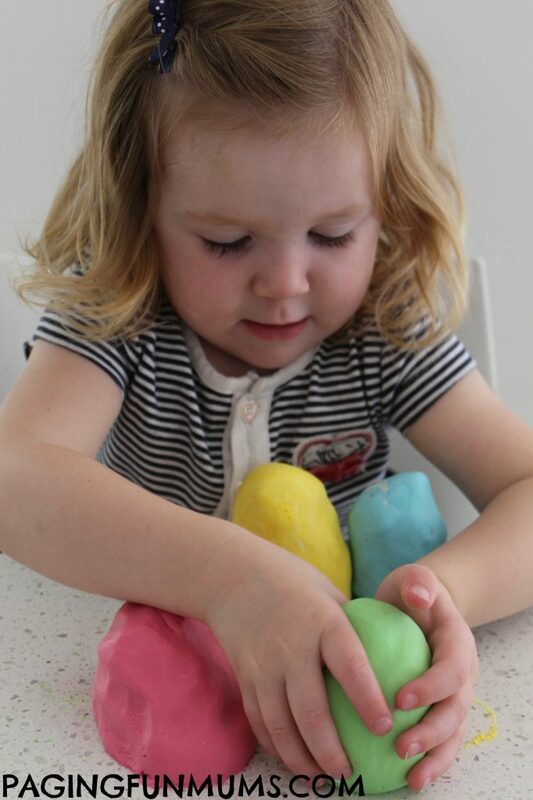 Have FUN moulding, squishing, shaping and playing with your new Playdough! Super fun and super easy! *Please note, this recipe is not able to be digested, so please ensure the kids keep it out of their mouth. Head to our YouTube channel here for some fun video craft tutorials! I just tried this and it worked out perfectly. My only advice is add the food coloring to the conditioner before adding the corn starch. The dough feels amazing!!! loved your recipe. New version of the old cooked playdough I used to make for my children. I added a few drops of lavender essential oil to one mix. This night time playdough only came out after bath and dinner. The warmth of little hands soon released the lavender aroma tiring my little ones. Bed time was a delight for my cherubs! What a wonderful idea! I might try that with my stepson, he’s very active just before bed! I used one whole bag and approx 2/3 of a bottle of conditioner. Just add conditioner a little at a time til it’s done. I’m taking the ingredients to preschool for the kids to make! Awesome! Thanks! Work in early childhood education, love your ideas. That’s great Janet!! It really is so easy to make, smells divine & is just like Playdough! My kids love it & we hope your preschool kids do too! Just wanted to say that potato starch and potato flour are two separate things. I would use the starch. Thanks for the idea! My son is mildly allergic to corn, so I was a little worried about using cornflour and I really want to try this. I will look for some potato starch today at the store! ha, never thought about using conditioner – very cool. the colors are lovely. Just saw this , my 2 kids where being annoying so we made this up in under about 3 min , now they are both outside playing ahhhhhh thanks for the piece and quiet. . Although I ran short of corn flour so I just topped it up with sr flour and it’s still beautiful and soft . And your hands feel nice and soft after playing with it . Is corn flour same things called corn starch? Wow awesome! Will definitely give this a go! That looks awesome! I wish I could try this recipe but I have a skin allergy to conditioner. I’ll bet the kids would love it. You could wear gloves while mixing. Hi Kate, Just wondering if you have tried sensitive conditioner? I have very sensitive skin. I use sorbolene based conditioner or there’s one called ‘simple’ or ‘tree tea’ those 3 are the only ones I can use for my skin but I always keep gojng to sorbolene. I get it from my local supermarket Coles or woolworths. Kate, I saw a similar recipe using hand lotion. Maybe there is one that would work for you? •Place all of the ingredients in a medium size or large pan. •Cook slowly on medium-high and stir it until the playdough thickens. •Thought there would be more steps? Nope, we keep it simple. Just made this it’s so easy! Just wondering how to keep it. I’ve put it in a zip lock bag, but I’m wondering how others keep theirs and how long it keeps for? A zip lock bag should be fine for a good few weeks – we are currently in Summer so we have refrigerated ours, it’s then nice and cool for the kids to play with :). It should last at least a couple of months in the fridge. No Muriel, as it contains conditioner, it is inedible. that is what I thought..thanks..
I’ve just made some of this and it was so easy to make, just have to work out the correect amounts as we are finding it difficult to use with cutters etc as it sticks. Added a bit more cornflour n a bit better, smells lovely and makes your hands soft too. I am a new grandma and I am looking for ideas to collect for future use to play with Grand children. thank You! Is cornflour the same thing we call corn starch in the States? And does this dry out if left exposed to air? Thanks! Both are the same…it’s called Cornflour in Australia & Cornstarch in the States. We stored ours in an airtight bag just in case. Corn starch, conditioner and food coloring,,so how is this 2 ingredients? Really? Why bother with a negative comment. Even better, add the food colouring to the conditioner before you add it to the cornflour. It makes it way easier to mix the colour through. Can u cook this and make it hard? Like so you cab keep a hand print or something? We haven’t tried it but we do have this awesome Homemade Clay Recipe – http://pagingfunmums.com/2013/08/29/diy-baby-keepsake-using-homemade-clay/. Love this and you best bet we’ll be making this! I seriously love corn flour. I swear, mix is with anything and it makes for awesome sensory play! So true! We always have loads of Cornflour in our pantry ;). Made it, playing with it, haven’t heard a peep for the last 2 and a half hours. LOVE IT. Hi Kerian, that’s fantastic news :). I hope you’ve enjoyed those 2 and a half hours? lol. 1 part conditioner 2 parts corn flour.. So exactly how much of each? Would it be 1 cup cond and 2 cups corn flour? Yes Lorinda – that will work perfectly. It really just depends on how much you want to make – ie. how many kids you have :). Have fun. just check your cornflour is genuine corn flour and not wheat based. Some is labelled corn flour but made with wheat so would not be suitable for your child with the wheat allergy. Cornflour also makes great ‘Ooblek’ an interesting medium that is neither solid or liquid but behaves like both (From the Dr Seuss Story – Bartholomew and the Ooblek). Hi Vicky, It’s Hair Conditioner that you wash your hair with. Just discovered you. THANKS !!. I am one happy grandma, as there are so many things I can make and do with/for my grand children. Am going to keep this as my “secret”. LOVE IT !!! Hi Sandy, We are so happy to hear that you love our page :). We have so many great crafts and activities to come :). This is a great recipe. Dollar store had everything I needed, so my playdough cost $2.00 to make 2 cups worth! What an amazing recipe! Thank you for posting! That’s fantastic! Thank you for letting us know. $2 is a bargain! To those of you who may experiencing ‘stickiness’ with you your play dough. There are so many factors that could contribute to this. It worked perfectly for us, using the ingredients pictured in a moderate climate. Perhaps high humidity climates could affect the dough consistency or different brands of conditioners. Actually they are the same, I just made it with corn starch and worked great. corn meal is what you make corn bread with. I think you mean corn meal that is gritty. Actually, there is a corn flour in the states that is still gritty, but a finer grind than corn meal. Just look for corn starch here and you will be set For this recipe. I bake gluten free so I’m pretty familiar with the different flour vs starch options available in the US. (Potato starch and potato flour are also different things). Going to make this for the grandkids when they come at Christmas. They can make something cool for their Christmas Tree. Nice recipe, but toxic. Is it edible? What do you think?!? Do your children normally eat conditioner?!? Craziness!!! Great idea. My daughter is sensitive to most fragrances in conditioners, do you think I could make it with sorbolene and add lavender oil for fragrance instead? is corn flour different than corn starch? I am from the States, but I live in Indonesia. The corn flour in Australia (and Indonesia) is the same as what we call corn starch in the States. (Corn meal is what we use to make corn bread. It is yellow or beige.) Both corn flour and corn starch are white. In a clear container, they look like powdered sugar (but of course, do not taste or act like powdered sugar!!). Instead of food color I used sparkles. Ran out of cornstarch though, so I tried potato starch just to top it up. Worked great but I got a little too much in and it’s not quite as soft as it was. Breaks easily. I will be sharing this recipe with many. Thanks! Add glitter! Im going to make purple clay with rose oil and pink glitter. Great idea, I just made some for my grandsons. Mine is not the exact consistency of playdough. It is more the consistency of between ooblek and playdough. Is it supposed to feel same as playdough, or kind of flowy like ooblek? I am sure my grandsons will like what I made, but just wondering. I am a daycare teacher in Canada and this will defanitely be a great science experiment. Thanks for sharing. I’m always eager to try new fun ideas for my preschool students! Thanks for the great ideas! Does the food coloring come off on little hands? I have the opposite question- if this gets left out, does it dry nicely? Excellent. Can’t wait to give it a try. But approxamitly how much shampoo would I put it to make a standard sized play dough? I am a Gr R teacher in South Africa and I will definitely try this recipe ,thanks for sharing. This is so neat. Me & my grand daughter will definitely be trying this next weekend. I absolutely love your site. 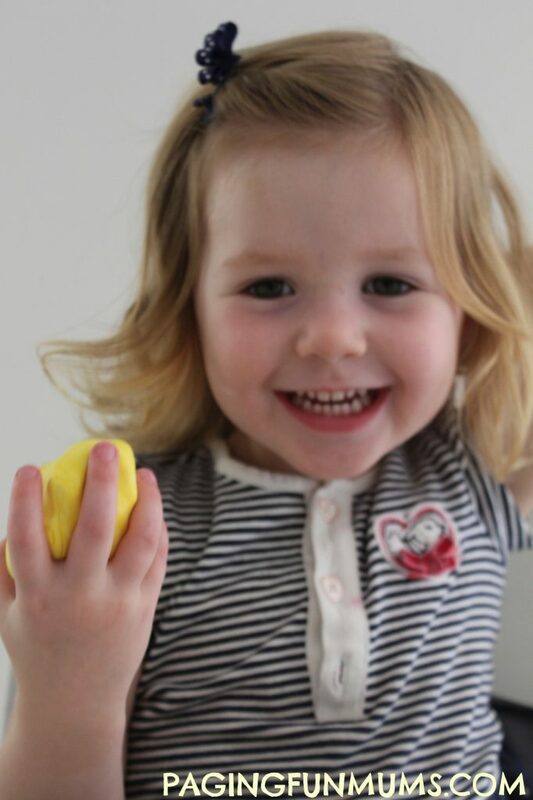 We’ve tried several different things from your site and my grand daughter and I have had so much fun. Thanks so much for your posts. Hi….in some comments you say keeps a few days in airtight container and others day zip lock bag in fridge for months? Just need to clarify. Cheers! Ps…your 3 ing lemon play dough…does this one keep better? If there are concerns about a small child eating this, add a bit of alum to the mix. ( its the thing that makes u pucker that is in pickles). Most children will remove it from their mouth as fast as they put it in….although there is always an exception to that ! thanks for the great idea – we are currently in venice and missing some playdough time. these ingredients i can source from the local supermarket. can’t wait to make it! playing with playdough has alot of great benefits and i believe children should be exploring this medium everyday. Hi, I just made a patch of this. It was great. However I used icing coloring instead of food coloring and my hands are now all pink :p. Just wondering would the same thing have happened with food coloring? Does it still stain when it is all dry. Thanks I’ll have to grab some the next time I in the store. Is there any particular brand you would recommend? since icing colors are usually very concentrated, I imagine that is why your hands were colored also. I think the liquid coloring would be easier to remove. I really like this but I only have corn starch. Is that ok to use? I’m going to try this in my classroom! Thanks, sounds wonderful! I just made this today with cornstarch, and it turned out fantastic! I added a little extra cornstarch for the right consistancy, but I also some lemon essential oil as well as yellow food coloring. It smells and feels awesome! I’m so excited to share this with my niece! Thanks for the great idea! Probably using ice would harden it up like a candle and be able to scrap it off the carpet. As a Sunday School Teacher of 2nd and 3 rd graders I can tell you I’ve had my share of playdoh on the carpet! Just let it dry! After 4 or 5 days take a plastic knife and just rub the knife back and forth to ‘scratch’ the playdoh out! Run a vacuum over the carpet and it’s clean again. this hopefully would work for you. I just made this with my daughter. We had fun making it and playing with it. The clean up was super easy too. Of course all of the colors were mixed together in the end. Lol. Watching her have so much fun and using her imagination was a blast for me. Thank you for this! Cant wait to try it. Does it keep well like the cooked play dough? Tip for play dough in the carpet. Just let it dry out and then you can scrape it off. Wow, this is cool!! I always made play dough for my Children and Child Care.. thought you had to have the alumn spice in it too, to keep it from getting hard.. A must try!! Excited to try this with my kids. We’ve made other playdohs, but used dry koolaid as the coloring…..smells amazing. Does it dry without cracking? I’d like to make it for art projects if so. Many Canadians also spell it ‘colour’. This is the British spelling it. Great idea! Corn starch sweeps up easily once it dries up! This is so funny! My old English Granny raised me to spell it colour , labour, honour,etc. I never got it counted wrong in class! Is it better to use conditioner that’s thick or thin in consistency? Can you make handprints in this dough and then let it dry to be kept as a memory of their little hands?? I made this for my boys all the time when they were young. We colored ours with an unsweetened package of koolaid. Made the playdough smell wonderful too. hello, this was our preschool, home school project . She had lot of fun. Im looking for the hand print dough instructions. Do you happen to have? I had my own catering business and made many wedding cakes so I have professional food colours. The kind you get at kitchen supply stores. They are more vibrant and concentrated than the food colours you get in grocery stores. Do you know if those work well? I just made two batches; one green, the other peach colored. I added more corn starch and kneaded it until it did not stick to the surface of my counter. I also added color gels as well. I teach preschoolers with Autism Spectrum Disorders so I am excited to use tomorrow. Lots of sensory here: textures and smells. My only concern is the smell might be too strong. If so, I will look for non-scented conditioners. Thanks for the idea! If you made a snowman, would it dry and keep its shape? Does this dry well? Like if I wanted to dry and lacquer a sculpture with it? Didn’t work out quite like yours mind it is a very humid afternoon it turned out like solid slime. But my son loved it and we had fun too. My hands look slightly bruise like from the food colouring but hey it will wash out in the next couple of days. 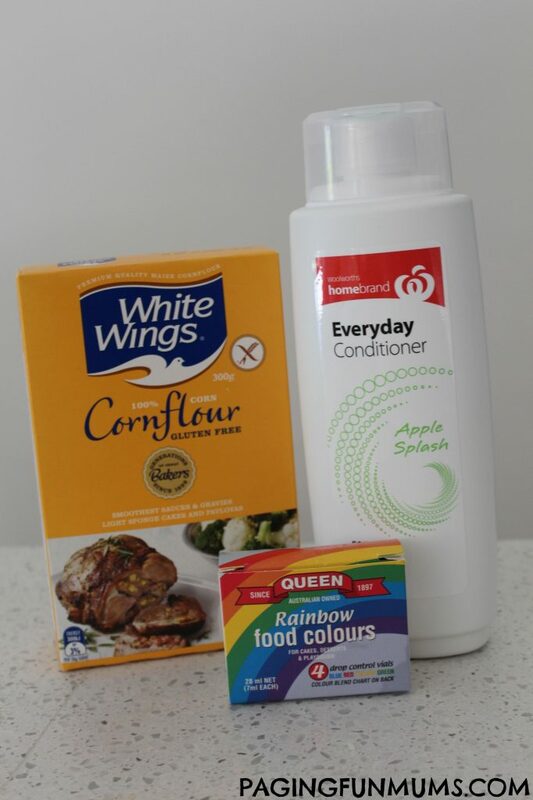 Cheap corn flour from Coles and fructis conditioner may need to have more corn flour but it is great fun to play with. My five year old is having a blast. just tried this with cornstarch but mine turned out more like slime, it runs through the fingers. Can I fix this? I love your ideas! Would you send me more please? Thank you. I have no cornflour due to intolerance with kids. would rice flour or potato flour work? I just saw this posted on FB and only had Corn Starch on hand. It worked great! Just had to add a little more than the 2 parts to 1 part it called for. My kids are LOVING it! Thanks! I had to look up corn flour, I had never heard of it! In the UK its corn flour, in the US its corn starch. WE’RE HAVING A BIRTHDAY PARTY SOON AND THAT WOULD BE FUN. GOTA GIVE IT A TRY. I am an aunt of 6 little ones and can’t wait to try this with them!! Thanks for the wonderful ideas! does this really need to be refrigerated? i work with a young man that is obsessed with playdoh. he doesn’t play with it much but needs to have several colors and takes them out of the container and looks at them, squeezes them occasionally. they dry out very quickly and if we don’t have replacements he does not understand why he can’t have fresh. this would be perfect to make for “replacement doh” but we don’t have a fridge near by. I just made this dough tonight and my autistic son loves it. Works Awsome with cookie cutters. I was worried about food coloring transferring all over the place so I used lime jello and strawberry jello and it turned out great. I added the jello to the conditioner first. Finally made it with my 2 kids last night and they loved it! But I supposed I put in a bit too much cornflour, so the dough dries up a bit after a while. we’re keeping it in the fridge for the night, hope it’s still ok when we want to use it again. For people who have allergies I use Free and Clear Conditioner and Shampoo. Mix one part Con. or Sham. to two parts water. Shake before using. Otherwise is too think to use. There is nothing in this product containing anything that causes allergies. I will be trying this playdough recipe in the next week or so. Has anyone used this recipe to make crafts to give as gifts? Beginning crafts to give away for gifts at Christmas 2014. Thanks for that great suggestion. I makes fondant just powdered sugar and marshmallows. My daughter likes to eat it that way no harm. but I might try this one with my son! You can use simple corn starch instead of corn flour. Hope this helps. Hi, just a minor correction to the recipe. I realised that I posted wrongly. Water is added to the mixture as one goes along mixing it. I am from Singapore. I do know that the corn flour we know of here is used usually as the batter for fried foods. It’s probably called corn starch in your part of the world. We also use it in our baking to create a lighter cake, muffin and so on. in the us we call this corn starch instead of corn flour. you can purchase it in any store. I used baby lotion corn starch, and then a little flour when I ran out of corn starch. Worked great! I found corn flour in the Mexican food section of the grocery store. Should have used corn starch. Corn flour is to gritty. Kids don’t really care they love it. Smells great I used strawberry conditioner. In the US, corn flour is called corn starch. no it’s not. Corn flour is ground corn. Corn starch is the starch removed from corn. BIG difference. I made this one today then got to thinking, “I have a lot of extra Bath & Bodyworks lotions just sitting around.” The lotion also worked and smells great. Loads of fun happening here in the freezing Wisconsin winter! 🙂 Thanks for the great ideas! My son is allergic to cornstarch. Do you think this would work well (or have the same texture) if cake flour was used? If allergic to corn, try using arrowroot purchased at your local health food store. I used arrowroot (tapioca flour) when I ran out of corn flour – worked great! Great suggestion! Arrowroot is a perfect substitute for any recipe that calls for corn starch. And unlike corn, it is non-GMO. You could try rice flour? No, cake flour will not be the same. The starch factor needs to be high. Try arrowroot/tapioca/cassava starch. Should work just the same. What does it mean – 1 part… 2 part…. I need to know for tomorrow !! It just means pick a way to measure and use that for all ingredients, and use as many times of that amount as the recipe says… If I want a small amount I might use a tea cup – so one tea cup of the conditioner and two tea cups of the cornflour… but when I want a big amount I might use a cereal bowl (one of conditioner, two of cornflour). I gave the ingredients to the daycare to do with my 2 year old and apparently it went down an absolute treat. Thanks! Looks fantastic! How long will it keep and where should I store it? Does this dry out if left out?? I wonder if you used organic conditioner if it would be safer for if the little ones pop it in their mouths? No safer or more dangerous than any other kind of conditioner. The ‘organic’ label only refers to the conditioner ingredients that are from plants. The other ingredients would be the same as in other conditioners, shampoos, etc. So, you still shouldn’t let kids eat the stuff. But if they did, they probably wouldn’t be in any more danger than if some got in their mouths in the bath when you were washing their hair. If you want the best information call a poisons hotline, or contact the manufacturer. Yes, unless you store it in an airtight container. Cornflour- buy this if yr in Australia. Corn starch- buy this if yr in the US. Please be careful of making this for children with sensitine skin. My daughter is very sensitive to fabric conditioner and could definately not play with this. I used the following, well known alternative. 2 cups flour, 1 cup salt, a little edible oil (corn/vegetable oil), food colour from natural scources (beetroot or similar) and enough water to produce the dough you want. Various softness/stiffnes are great at different times. It’s not fabric softener, it’s hair conditioner. If you have super sensitive skin it doesn’t matter if it’s fabric softener or hair conditioner. I do, and I break out like crazy with certain brands of: dish soap, laundry detergent, soap, body wash, lotion, shampoo, conditioner, makeup. In other words, anything that goes on the skin… Just if your child has sensitive skin, be aware of what you are using in it and use something that won’t bother him or her. In my opinion, this is a “one day” kind of dough. I make it often with my daycare class of two year olds and it lasts through one day of playing and then gets really dry and crumbly. But it’s so cheap and fun that really doesn’t matter to us. We use fruit scented conditioners and little ice cream scoops, cones and bowls that I got at IKEA for about a dollar–instant ice cream party! And no, they have never tried to eat it. Have fun! There is a difference between corn starch and corn flour. They are made from different parts of the corn plant and have different properties. I tried corn starch and it didn’t work but the corn flour did but broke apart super easily – not as elastic as real playdough. I wonder what I’m doing wrong. The recipe I am currently using is 1 part each of potato starch, corn flour, plain flour and water. Would you by any chance know if salt is really needed to keep this mixture preserved in its state for about a month? I was just wondering how long this playdoe last? how about if it stays in the refrigerator? and you are one of them. oh, and you are mean too!! Love this! My little girl is very excited to try! Tried it and it worked brilliantly. My little boy loves it. Please help me! I’m making for tomorrow’s bd party. How long will the playdough last in a container?! Thank you!!! Parts refer to what ever measuring unit you use. If you use the scoop that came in the lemonade or the kid’s play kit, use 1 scoop A, 2 scoops B, 3 scoops C.
Pick your measuring container and use the # of each that the recipe says. This type recipe makes it easier to make the right size recipe. Great! Got my own playgroup, and will use al the idea!!!!! I gave my 4 year old grandson the ingredients with cup measures and just watched him make it himself. He was super proud. So was I. Thanks Jenni for sharing. Just wanted to say how much I LOVVVVVVVVVE this recipe! Made it tonight as a tester and it’s so great! The best thing is that I used some tea tree conditioner, so it smells gorgeous and is green so doesn’t need any colouring 🙂 thanks Paging Fun Mums! i want know that abouth the ingreadents u use for this ,, 1st is wat u mean by conditioner? is it hair conditioner? and 2nd question is wat about the flour? no need to add flour for this? Just found you. I am a grandmother of 3 boys…6, 4, 1. Where have you been all my life? Looks like so much fun. Can’t wait to try this “playdough” fun mixture. Look forward to future finds on your website. My daughter was very upset to find our playdoh had all dried out (at 8 am this morning). Google sent me to this post, and in a matter of minutes we had pink “playdoh” again. She loves it. When my son woke up a bit later, we made some green for him. They are happily, and quietly, playing together! Thank you so much for this idea! We are Expats living in East Timor and good quality toys and activities are just not easily available here. My 2 year old loved this playdough and I am certain we will make it over an over again. 🙂 We used potato starch and conditioner and it came out perfectly! Also, I am a play therapist and will definitely be directing clients/patients to your site. Bless you! We made this with my prek class today and ours was a mess too, at first. Then, We just dumped the rest of the corn starch in and gradually added more n more conditioner until it formed dough. We were telling the kids that scientists make mistakes too, and that not all experiments turn out the way you expect. Just keep trying. .. It will work (eventually…) Don’t give up! Hey, my daughters, Caitlyn and Freya tried this for their science expo! It was lovely and their teachers commented on how excellent it was! I love this site! My little baby is gonna love it when it’s born! Caitlyn and Freya, my ten year old twins, loved it! Thanks SO, SO much!!!!!!!!!!!!!!!!!!!!!!!! Can I use All Purpose flour or any flour instead of cornflour? You could probably use any starch powder–corn & potato are the easiest to find and the cheapest. Corn flour (UK) is same as cornstarch (USA). For the child care centers who wanted the dough to last longer than one day, you would do better using the flour, salt, oil receipe and add Kool-Aid to the water you are using, this adds a nice scent and for some reason it makes it softer. Also the kids can add flour if it gets sticky, and they love using the flour, its like making real, but pretend cookies and cakes. The reason for using this receipe is you refridgerate in a large plastic storage bag and they love that it is soooo cold, warms up as they play and will last for about 2 weeks. My class has 18, 3 and 4 yr. olds and it comes out every day for play by at least 6 to 8 kids each day. Its good with rolling pins, cookie cutters and also plastic knives for cutting in pieces. For richer colors add some neon food coloring. If you are having problems, you may be using corn meal instead of corn flour. In the US (and perhaps other places?) corn flour=corn STARCH. Make sure you are using the white, fluffy powder that is often used for thickening sauces. The most popular brand is Argo. I would love to have new ideas to use with my sk/gr1 after school program. Hi I’ve seen many different tyes of play doh recipes and wounderin of baby powder would work to. Oh my god, this is too genius! Finally a play dough mix that doesn’t require me to cook and fridge anything! I’m not a lazy parent, but come on, realistically I don’t have time to be cooking play dough every day >_< Thank you for making this easier! My kids play through play dough so much and it always dries and then we gotta buy more of that real-non toxic stuff. This way, I can use some of my organic hair conditioner and not be too worried. Thanks girl! So far, your website has amazing ideas for crafts for my kids! 2 thumbs up! This is awesome! Was looking for alternatives to Play-doh brand and came across this! I had both ingredients on hand, made it right up and it was a huge hit with my home daycare kids. Thank you! One question; If it ends up getting crumbly, would adding more conditioner and kneading it help? Or am I better off just making a new batch? I’d like to salvage what I can, when I can. Thank you! Is the dough supposed to be very powdery? mine keeps falling apart and every time i pick it up it gets my hands filled with cornstartch or some thing. and it falls every where. the tiny peices make a big mess. what do i do? I just recently found this recipe and I think it’s amazing. But I was just wondering how long does the dough last for? I made it with my Girl Guide group but it seems it doesn’t last for long?